A truly versatile piece of kit. 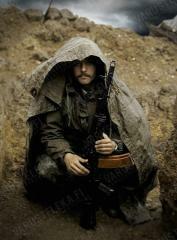 Like most shelter halves used by armies worldwide, the Soviet model bends to a multitude of uses. There are better alternatives on the market, but the Soviet Plash is still the best with its ancient magical aura. 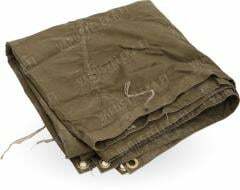 This age old design can be used as a groundsheet, shelter half, rain/camouflage cape, stretchers, or a top layer for sleeping bag/blanket - you can even make a sort of a raft from these. In almost every use it's just a tad too small on its own, part of the rugged charm! There are a few variations of these, one with leather reinforced corner holes, one with brass grommets. Both work just as well, we do not differentiate. 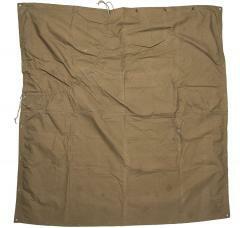 Made from very tightly woven and impregnated cotton, measurements 170 x 170 cm, weight 1,310 kg. If you wash it, the colour will fade and the water repellency (if present anymore) will suffer. When you have wandered the realm long enough to wear the water repellent treatment down, you can use fabric wax to reproof it! Most are in totally unissued condition, but since some are used we simply label these all as "used army surplus". Still, even the unissued ones might well be a bit dusty after decades of storage and some have other signs of storage, like slight fading here or there from the sun. Ostin enimmäkseen koristeeksi koska ajattelin et jos haluaa olla ruski niin se viedään sitten loppuun asti, yllätyin. Tuli yöllä kuulasotiessa aika kylmät kelit yllättäen, ja tästä tulikin täydellinen mukana kulkeva peitto ja piti kaiken epämukavan irti muusta sotasetistä, ei päästä vettäkään läpi. Mokoman pakkaaminen ja mukana rahtaaminen on joskus hyvin ikävää Vesmeshok repun lenkeissä, mutta silloin kun silloin kun sitä tarvitsee niin korvaakin kaikki ikävät hetket, plussana tyylikäs. Toimivuuden näkee kopioiden määrästä. "Kangas" on tuhoutumatonta, mutta napit ja narut ei, joten kannattaa solmia jokaisen narun päähän joku pallo hidastamaan purkaantumista, tai saatat joutua vetämään omat pieniin "kauluksen" koloihin. Leka yllätti (kuten usein ennenkin) ja laatikkoon oli tungettu lytätty kasa kurjahkoa kommunistinarua joka oli ilmeisesti säilötty kuivissa oljissa (ja pienissä puulastuissa??? ), joten kokemuksesta suosittelen pysymään kaukana matoista ja vastaavista innostuksissa repiessäsi laatikkoa auki. En voi sanoa kuin, että Saatana! Välittömästi yksi siisteimmistä asioista minkä omistan. Kaksi VSR-kuvioista omistan, toinen nyt väliverhona eteiseeni ettei myrskytuuli puhalla läpi kämppäni. Näitä on olemassa kolmea eri kokoa ja nämä täällä myytävät edustavat sitä pienintä mallia . Kulmareikien määrä sen paljastaa. Näihin saa napitettua kiini myös DDR- telttakankaan ja käyvät laajennusosiksi unkarilaiseen taisteluparintelttaan, ymmärtääkseni. Näiisä itsessään on aika kämäisesti kiinnitysnappeja/muovihärpäkkeitä . Excellent bit of kit, will last for a lifetime and is easily maintained, as its made of impregnated cotton its easily reproofed and/or waxed for weather resistance. 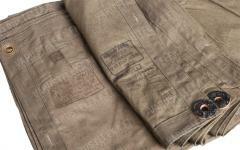 It is also easily repaired with buttons or patches able to be sewn on. Excellent, very multifunctional and extremely tough bit of kit. Even though I haven't used it in the field, I can see why it's so popular: good fabric, easy to store (folded/rolled), lots of different uses, all at a reasonable price. Mine came without two buttons (a common thing with surplus stuff and easy to fix) and a footprint on the back (removed with a wet sponge). Finding the owner's name tag still attached was priceless and its value increased massively for me. The pleasure of buying surplus equipment. As if God intented it to be this way, a short but rather intense rain shower moved past my house just hours after my plash palatka arrived. So of course I immediately tested it out in my backyard. It blocked the rain wonderfully, I could hear it hit the plash palatka like I was sitting in a very expensive tent. I even got visited by a bird who was looking for worms, he didn't even seem to notice I was there. If I had to list a downside I would say it's a bit heavy. But only menly men who don't care about a little weight shop here right? Spot on piece of kit, mine came and shows zero signs of use what so ever. I've done a bit of reading up and if the reenactor's information is correct the Plash Palatka I received dates from the Second World War! Apparently post war models have brass grommets and metal buttons (like the NVA equivalent) where as the one I have has the wooden toggles and sewn leather grommets. If it's truly that old there's no wonder it stank so bad of old warehouse. Thankfully that washed straight out and I've been left with a very cool piece of history. Great piece of camping gear or just Soviet memorabilia, definitely won't break even if you use it for what it was supposed to be used for! Probably one of my favourite items to come out from the Soviet Union. Amazing piece of equipment. Quite waterproof, extremely tough and enough for a survival shelther. Damn, I spent so much in fancy tarps and fjellduk and this is the one I always carry with me when I have to care for the minimum. 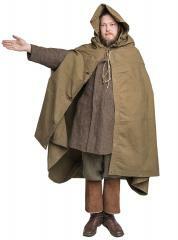 Even in pouring rain it will protect you as a poncho. It will become finally wet but, don´t ask me how, you will not. And come on, for this price you don´t have to worry about the fragile-super-cool-light-weak-material tarps around the market. An excellent piece of history, post WW2 manufacture, but identical to ones used in WW2. That charming Soviet crude sturdiness. Very good product! Mine was almost new!! It came with wooden toggles and sewn leather grommets, old school! Just received mine as my first order from Varusteleka. Exactly as described and shown in the pictures. Gave off a helluva smell, like sticking your nose into an abandoned 100 years old root cellar, but that's to be expected. Sturdy Soviet quality, will probably last longer than I. Only drawback is it's weight. Haven't tested it in the field yet, but it'll probably become quite heavy to carry with you after a while. But that could also be seen as a boon I suppose, as weight often magically translate to warmth somehow. The one I received is unissued,I can see why these are so popular.Get one while they have them in stock because they sell out quick.a great piece of military surplus.Excellent service as always when you buy from Varusteleka! 5 stars! died of exposure. She is now in a care facility and refuses to be parted from it. This is one of those humble items you throw in a vehicle or kit and find a thousand uses for. Vraiment bien, en très bon état vu l'âge. Une belle pièce de collection. Leave it to the Russians to design an item that is as useful as it is indestructible. I mainly use mine as a tarp for covering the ground or for shelter when hiking in crappy weather, but the poncho option makes this bit of kit exponentially useful. During a particularly nasty snowstorm I had to rescue a family member in an emergency with their car stuck in a ditch, and I wore this to protect myself from the wind and snow. It worked surprisingly well for that purpose. I probably looked like a crazy hermit wearing it out in town, but looks don't matter when it comes to functionality, and when it comes down to it, I would bet my life on this poncho, as I'm sure many Russian soldiers also did. Received a brand new one, never issued. Leather grommets and wooden toggle buttons. Russian stamp in a corner is perfectly readable. 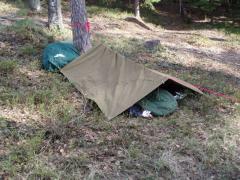 Immediatly tested against cold wind : perfectly windproof.